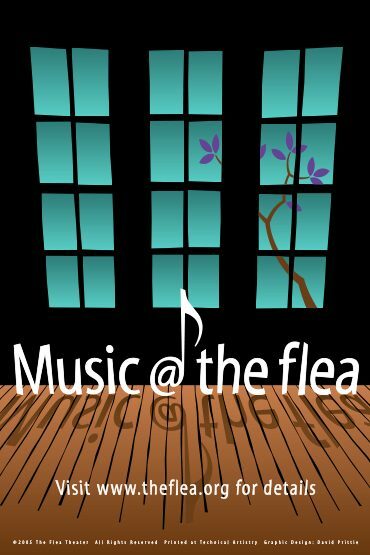 The Flea Theater is delighted to announce Music @ The Flea. Lisa Karrer and David Simons perform highly original works for voice, interactive Theremin, video with soundscapes for brain scan, time warp and magnetic sculpture, molecular self-assembly with processed voice, and compositions featuring voice, slide guitar, percussion,jawharp and laptop. Gene Pritsker takes music from his opera “William James’ Varieties of Religious Experience” and creates an 8 movement, one hour suite for 2 electric guitars, cello, contra bass and drums. Sound Liberation will perform the entire suite with a visual back drop by VJ Astrid Steiner. Sound Liberation is Gene Pritsker – guitar, Greg Baker, – guitar, Dave Gotay – cello, Mat Fieldes – bass, Damien Bassman – drums. Gene Pritsker’s Sound Liberation and B3+ Brass Trio will be performing music from their albums on Col Legno records; ‘Open Up Your Ears & Get some’ and ‘Uncommon Sense’. Both albums were recently released on Col Legno. They will also perform music from Gene Pritsker’s opera ‘Money’. B3+ is Franz Hackl – trumpet, John Clark – horn and Dave Taylor – bass trombone. Sound Liberation is Gene ‘Noizepunk’ Pritsker – rap/guitar, Dave ‘Criminal Cello’ Gotay – rap/cello, Charles ‘Das Krooner’ Coleman – vocals, Chanda Rule – voclas, Greg ‘B-man’ Baker – guitar, Franz ‘Big Brass’ Hackl – trumpet, Dan Cooper – bass, Damien Bassman – drums. VJ Astrid Steiner will provide the visuals. David Simons is a composer and performer specializing in percussion, Theremin, electronics,homemade instruments, and World Music. Recordings of his works include the CDs “Prismatic Hearing” (Tzadik); the opera “The Birth of George” (Tellus/Harvestworks) w/Lisa Karrer; Kebyar Leyak and Cool it Wayang for Gamelan Son of Lion (their 2009 release on INNOVA includes Naked We Stand); and on albums by God is My Co-Pilot, Stockhausen, Shelley Hirsch, Music for Homemade Instruments, and many others. David’s work in music for theater and dance has brought him to Zagreb and Tallinn, Seoul and Yogyakarta, Munich and Berlin, Guantanamo, Honolulu, and Bali. He has been awarded a Rockefeller Bellagio residency, NYFA fellowships, commissions from American Composers Forum, MaryFlagler Cary, Meet the Composer; travel grants from Artslink and Arts International.Simons’ composition “Odentity” for the Harry Partch instruments was premiered by Newband in 2007.David is a graduate of California Institute of the Arts. His writings on music and sound are published in Radiotexte(Semiotexte#16), EAR magazine and Soundings. Lisa Karrer and David Simons perform their own compositions for Indonesian Gamelan, Homemade Instruments, Western orchestra, theremin, sampler, computers, performance installation, opera and new music theater, as well as acoustic and electronic arrangements of Estonian, Bosnian, Yiddish, Thai, and other deconstructed world music pieces. They have received numerous grants, commissions and travel awards to perform their operas and other works in New York City, Hawaii, Indonesia, the Baltics, and throughout Eastern and Western Europe. Kathleen Supové (Curator) is one of America’s most acclaimed and versatile contemporary music pianists. She regularly presents a series of solo concerts entitled The Exploding Piano, in which she has performed and premiered works by the world’s leading composers as well as countless emerging ones. The Exploding Piano is a multimedia experience that employs theatrical elements, vocal rants, performance art, staging, electronics, and collaboration with artists from other disciplines. Kathleen has appeared with The Lincoln Center Festival, The Philip Glass Ensemble, Bang On a Can Marathon, Music at the Anthology, The Bill T. Jones/Arnie Zane Dance Company, and other venues, ranging from concert halls to theatrical spaces to clubs. Her most recent CD is INFUSION, released on the International Classics label, which features music for solo piano and electronics. Other recordings can be found on the Tzadik, CRI, Innova, New World, Neuma, Bridge, Centaur, OO, and XI labels. Recently, she appeared in Carnegie Hall, in the historic performance of Terry Riley’s IN C, curated by the Kronos Quartet. Visit www.supove.com and myspace.com/supove for more information about concerts and projects. Admission is $20. Tickets may be purchased by clicking the red TIX button above, by calling 212-352-3101, or in person at the Box Office, which opens one hour prior to show time.